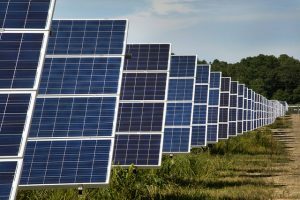 OurEnergyPolicy.org | Is Utility Solar Better Than Residential Solar To Meet Renewable Goals? Is Utility Solar Better Than Residential Solar To Meet Renewable Goals? Twenty-nine states have renewable energy mandates. California’s mandate calls for 33% renewable energy by 2020 while New York State mandates 50% of its electricity be renewable by 2030. It is one thing to set energy or electricity mandates and quite another to achieve them. New York is quite fortunate; today 26% of its electricity comes from renewable electricity sources. However, large hydroelectric facilities today provide 80% of NY’s renewable electricity electricity and, unless more hydropower is imported from Canada, an expanded contribution from large hydropower seems unlikely. So to meet this 50% mandate, solar and wind which today produce 5.2% of NY’s renewable electricity would have to expand 462% over the next 14 years or on average, about 33% per year assuming no growth in the electricity demand over the same period. So how do states achieve these mandates recognizing that enormous growth in renewable electricity is necessary? Many jurisdictions will look to distributed energy and in particular solar photovoltaic (PV) panels as a major contributor. But not all solar PV are equal. When compared, in 2015 residential PV was significantly more expensive at $4.17/watt while utility scale PV cost $2.34/watt. While it is true that rooftop PV has significantly decreased in price and does offer benefits like carbon-free electricity, greater electricity independence, and reduced consequences when the grid is disrupted from extreme weather, human error, or cyber attacks, unless there is a breakthrough, it is likely to remain more expensive than utility PV. And if a state’s goal is to support renewable electricity at minimum cost, then pursuing the utility pathway seems to be preferable. Actual PV electricity production in the U.S. appears to support this approach. In 2015, utility scale PV produced about 2/3’rds of 1% of the nation’s electricity or about twice as much as rooftop PV. Yet states continue emphasizing policies that support residential PV to meet clean energy goals. Expanding individual electricity independence, especially as various renewable electricity subsidies are phased out, comes with a cost that may not have been fully considered. (1) Should states implement policies that emphasize utility PV over residential PV to achieve renewable electricity mandates? (2) What are the prospects that residential PV will play a significant role with this energy transformation? 19 Responses to Is Utility Solar Better Than Residential Solar To Meet Renewable Goals? My exhibit “Gallery of Clean Energy Inventions” is linked at my websites padrak.com/vesperman and commutefaster.com/vespermanhtml. It includes a profile of “Advanced Solar Photo-Voltaic Crystal Lattice Cells”. The text reads: The I.N. Frantsevich Institute for Problems of Materials Science, Kiev, Ukraine, has invented advanced solar photo-voltaic crystal lattice cells which can simultaneously convert almost all wavelengths into ionic flow or electrical current from extra-low frequency long wavelengths all the way up through the visible light spectrum, X-rays and beyond. At night efficiencies, regardless of weather, greatly exceed Western solar cells operating in sunlight. The cost of electricity could be reduced to less than $.002 per kilowatt hour. For a detailed description see pages 72-74 of “102 Electrical Energy Innovations” which is also linked at the two aforementioned websites. The “Gallery of Clean Energy Inventions” also profiles “IPMS Crystal Lattice Energy Storage/Battery Device”, Its text reads: The I.N. Frantsevich Institute for Problems of Materials Science (IPMS), Kiev, Ukraine, has developed an energy storage device which works on a completely different principle from chemical batteries. Requiring only 15 to 30 minutes to recharge, IPMS crystal lattice energy storage devices produce the same current and voltage levels throughout 98% of their discharge cycle. They produce no heat during discharge, regardless of the rate at which they are discharged. Their quick recharge capability allows them to easily capture regenerative braking energy, extending the electric vehicle’s range. Their energy densities of between 850 and 1050 watt-hours/kg are about a third more than gasoline’s energy density of between 550 and 600 watt-hours/kg. They operate well in the temperature range of -40 to +60 degrees centigrade. Pages 126 through 136 of “102 Electrical Energy Innovations” provide a detailed description of these batteries. By combining these two IPMS inventions and mounting them on rooftops it seems possible to electrically power many buildings without connecting to the local electric utility. It may be a pipe dream, but states should adopt a neutral policy approach. If individual customers wish to pay for more expensive (rooftop solar + inverter) for resilience purposes, they certainly should be able to, and any power they generate that goes into the grid should be counted towards a state’s renewable portfolio standards (RPS). If utilities find it economically beneficial to install or subsidize distributed rooftop systems (for managing local peak loads or delaying substation/T&D infrastructure upgrades, for example), they should be free to do so and have any generated power counted towards the RPS. And if it is most economical to build large utility-scale PV installations, then they should do so. But I see little state-level value for subsidizing one form over another, and large potential cost. One other small quibble: 462% growth over 14 years translates to about 11.5% per year of annual growth rate. Brent’s comment has value in that such an approach might have avoided some of the conflicts we see today when Public Service Commissions have set up net energy pricing schemes that some claim favor one segment of the population over another. Similar complaints can be presented for subsidies, especially by people who live in apartments and can not receive solar subsidies similar to those who own their homes and have roof space for residential PV. However, Brent’s suggestion seems to be a largely market based approach which may not achieve the renewable energy goals that many states have put forth. What then? Dan is correct that costs for installing residential PV are lower in Germany than in the USA. DOE’s November, 2015 ” Revolution…Now” quotes a price of $2.14/watt in Germany for residential PV versus $4.17/watt in the USA. This would be in line with today’s utility PV prices of $2.34/watt. Some of the same red tape cost reductions that residential PV might experience could also apply to utilities so it seems likely that utility PV costs would continue to be lower than residential PV, but less red tape would benefit both. Making cost comparisons on a consistent basis seems essential when planning for our energy future. I just read that Al Gore was not fundamentally opposed to nuclear power but ruled it out because of high costs. Yet the NREL’s 2016 analysis of LCOE ( Lifetime Cost of Electricity) had nuclear power as the lowest non-fossil fueled source of electricity. The NREL LCOE analyses were based on a 40 year nuclear plant lifetime, whereas many nuclear plants are now licensed to for 60 years and an effort is underway to determine if an 80 year nuclear power plant lifetime could be licensed. What would be even more insightful would be cost comparisons without any subsidies for any technology so that an apples-to -apples comparison could be made. First, Dan is right about the comparative installation costs. Panels costs have remained fairly steady recently and the drop in costs is mainly in installation costs. However, residential rooftops each have local permitting and connections, making them always a bit more costly than larger scale, especially until connections become more standardized. Second, you are right to say that residential, or distributed PV offers advantages, but according to NREL “Nearly half of U.S. households and businesses cannot access rooftop solar … NREL also reports that 48% of commercial buildings have roofs too small to host on-site solar PV of any meaningful size (i.e., covering at least 20% of their demand). •	Community-scale solar avoids constraints facing other markets and can reach utility-scale economics while leveraging distributed benefits. •	Buyers and sellers together can innovate and unlock cost reductions of up to 40%. Jane’s response is excellent. I might add that community scale solar combined with storage has other potential benefits, the most important is cyber security, in my view. A cyber attack would be less damaging if downstream customers could be served for a number of hours by a combination of community scale solar and local energy storage. Sites could be chosen that would be less hindered by issues of roof size or shading. Installation of panels on the ground would eliminate concerns about panels causing leaks in the roof. These sites need not be any source of water used as a heat sink and could be placed largely out of public view. The most important siting criterion might be having these installations near a transmission or distribution network which seems certain if they are community serving facilities. The grid could supply off-peak electricity to supplement the electricity generated by the renewable energy sources thereby assuring high reliability. Community scale facilities could be operated by a utility or could be operated by a co-operative with utility backup when renewable energy supplies are low. Increasingly, combinations of centralized sources and distributed sources with energy storage seem to be more sensible for most people than seeking total independence from the grid which very few would/could opt for. The “Road Not Taken” leads to a mix of decentralized and centralized sources, both with storage, and a mix of renewable energy and nuclear power. The quicker we come to this conclusion the better we will limit the damage from climate change. Would you provide links to the NREL, RMI, and Brattle Group reports you reference? The differentiation of costs between utility-scale and user-scale solar is actually a false approach to address electricity. This sounds similar to the fight to open up the wired communications grid and allow non-wired options (cellular towers). The issue is to allow consumers to have the option to decide what they want to pay for a unit of electricity as well as other options such as reliability, power quality, and emissions and wastes. Why we would want to preclude those options on an incomplete set of value options based only on cents per kWh ? The fact that utility-scale solar is less expensive per kwh, still doesn’t compete with higher electric power quality (lack of surges, sags, and transients), less transmission and distribution lines and transformer losses, and with batteries, much higher electric power reliability. Right now the consumer totally bears the costs of poor electric power quality and loss of electric power – not represented in the cost of utility-scale PV mentioned. There should be no bias in electric choice for consumers, including utility-scale vs user-scale solar. Consumers should have the right to make solutions with transparent tracking of real-time electricity costs, energy losses, electric power quality, electric reliability, and emissions & wastes per unit of electricity. Scott’s comments seem similar to those made by Brent Nelson and I suggest that he look at my reply to Brent. All the factors that Scott lists, such as surges, line losses, reliability, would have to be monitized and this information should be made available to the consumer. This is very complex because many of these cost factors are time of day, location, and season dependent, but I believe that California is exploring a similar approach in setting new construction criteria. If all of the issues that Scott has identified could be quantified, then we return to the initial issue of what does one do about the differential cost between residential and utility scale solar? Even if consumers could be fully informed on all of Scott’s issues, does this lead to meeting State renewable energy mandates? I have a different thought about costs from different non-carbon sources of electricity. Studies show that the damage from climate change increases as a function of how much we exceed some temperature increase, such a 2 degrees C. If one has a mix of non-carbon sources A+B+C, each with its own set of infrastructure, manufacturing, implementation, and operational constraints, one should pick that mix of A+ B+C that minimizes the damage from climate change by a specific date. It wouldn’t matter if A cost more than B or C if the combination of A+B+C is less costly (Less damage from climate change) than a mix that rules out A because it is more expensive than B or C.
The name of the game is minimizing the damage from climate change and therefore which mix does this best. We need to refocus these cost discussions away from the cost of one energy source versus another to what mix of sources, each with its own set of constraints, minimizes climate change damage. My guess is that the costs of different levels of climate change is so large that the differences between A or B or C is unimportant. This process of minimizing the damage from climate change in my opinion leads to the conclusion that I gave Jane Twitmyer, that we need a mix of centralized and decentralized non-carbon sources of electricity and a mix of renewable and nuclear energy, all built on a strong effort in energy conservation. Herschel: While you are correct that the costs of climate impacts will far outweigh the costs of trying to minimize those impacts, we still have limited resources (time, money, manufacturing capacity, etc.) to work on solutions. Therefore, we should try to optimize our response so we get the most bang for the buck. The easiest way to do that is to put a price on carbon that truly reflects the damage that it will cause. With the proper “market signals,” the world will get to work addressing the problem while dedicating resources is a fairly efficient manner. Note that at this point, major impacts are unavoidable (e.g., major sea level rise, +2ºC and more warming, mega droughts, etc. ), so we will also need to dedicate resources to responding the impacts we have already committed to. It’s a shame that we have avoided action on climate change for the past 30 years. Better late than never, but no one will be happy about what’s coming down the pike. While I support putting a price on carbon, it might not accomplish what we want in terms of limiting the damage from climate change. It is important to put a rough price tag on what it would cost to have a low carbon future. I have selected just three areas to make some rough cost estimates (1) cars and light trucks (2) The Electric Power Industry and (3) replacing fossil fueled end use devices in residences and commercial buildings, such as gas/oil/coal space heaters and gas hot water heaters in the 132 million housing units in the USA. I have not estimated what it would cost to decarbonize industry and agriculture, or make high energy density non-carbon liquid fuels for aircraft and heavy vehicles or the cost of increasing our transmission and distribution network, or greatly expanding energy storage. I have not estimated the cost of the new factories needed to build these non-carbon energy sources or other infrastructure expenses. I have no estimates of the pinch points in our transmission and distribution networks that would prevent full use of electric vehicles in city areas. For the 253 million passenger cars and light vehicles presently in the USA, if they could be replaced at an average cost of $25,000, this would come to about $6.3 trillion dollars. If one were capable of having a non-carbon electricity supply system I estimate that this would cost about $2.0 to $4.0 trillion dollars where the smaller figure is for all new sources of electricity with a capacity factor of 90 % and the larger figure is for a mix of energy sources with an overall capacity factor of around 50%, similar to today’s electric industry’s load factor for the New York/ New England area. I further estimate that ic could cost $1.5 to $2.0 trillion dollars to replace about 300 million end use devices that provide space heating, hot water, and air conditioning, where space heating and how water appliances today burn fossil fuels and where new air conditioning units using ice storage are necessary to shut down peaker units. All told, this rough and incomplete estimate comes to $9.3 to $12.3 trillion dollars. Is it reasonable to expect that this mass of money could be extracted over the next 37 years from the industries that use fossil fuels, especially during a time when we are suffering other losses from climate change? If fossil fuel-using industries go bankrupt then they would no longer pay carbon taxes. If the collected carbon taxes are further redistributed to the public, then even less money is available to build these non-carbon energy sources and end use devices. It would be a major conclusion to realize that we need to do far more than establish a carbon tax. We need to put an approximate price tag on a carbon-free future and see where that takes us. Herschel: In some ways, it’s simpler than you describe. The bottom line is that we need to get to zero net emissions by around 2050 and we need negative emissions after that to have any chance of staying in the +2ºC warming area. We are on the path to +4ºC and beyond warming this century and that level of warming “is not compatible with an organized global community.” In other words, it’s essentially infinitely expensive. How much is all the real estate in Southern Florida worth? Some estimates for the cost of climate impacts are on the order of a thousand trillion dollars by the end of the century. So the bottom line is that we need to get to zero emissions ASAP. It doesn’t matter what it costs. It’s actually not as expensive as people think because, for example, people are going to buy new cars anyway, so replacing current cars with zero emissions cars doesn’t cost much at all. But it is incorrect to just look at the cost of moving to a zero emissions world without looking at the cost of not moving there! Not moving to zero emissions will be orders of magnitude more expensive — whether we can afford it or not — than doing the right thing. When you look at all the costs, fossil fuels are one of the most expensive fuels you can imagine burning. In comparison, moving to zero emissions energy is a bargain! Two quibbles. First, 99% of rooftop solar installations in this country do not contribute to “reduced consequences when the grid is disrupted from extreme weather, human error, or cyber attacks”. They’re grid connected, and when the local grid goes down, they go down with it. That’s a mandatory design feature of the inverters for small scale grid-connected PV. It’s possible to get around it, but it requires batteries and special switches that automatically isolate the PV system from the grid if the grid goes down. It’s a lot of expensive equipment, and likely requires the use of non-standard PV panels. Second, nearly all grid-scale PV systems being implemented these days are at least single-axis tracking systems. That means they will deliver around 35% more energy over the course of a day than the fixed panels of a rooftop solar installation. They’re also typically better sited to avoid shading from trees that can easily reduce output from rooftop PV installations by 50%. Roger: Thank you for your ” quibbles”, excellent points. As to your first quibble, this is very important in an age where cyber security is of great importance. It seems to further tilt things in favor of utility scale installations. As to your second point about grid scale PV and the greater capability to capture and produce electricity this too is important. Note Jane Twitmyers’ comment about the NREL study which concluded that about half of the commercial and residential buildings can not access roof top solar because of shading and limited roof space. These limitations have led some to consider community sized installations which are thought to reduce such problems. It seems, according to a new study of the Duck Curve that a combination of distributed and utility scale solar will work better than only looking for utility scale projects. •	The report found that net load, or the belly of the duck, is “significantly lower” in 2016 than forecasted, with the minimum daytime net load dropping 31% from 2011 to 2016. •	Ramping hours, the neck of the duck, were also greater than expected, with the three-hour ramp exceeding 5,000 MW 58% of the year in 2015, up from 6% in 2011. •	The report found that significant changes in daily daytime minimum net loads and daily late-day ramps are primarily driven by utility-scale solar in California, not distributed generation as expected. “Preliminary tests of peer-to-peer transactions between neighbors were successfully completed in April 2016. Jane: These conclusions are consistent with my own analyses. What I have found that centralized sources of electricity can enhance the use of distributed sources of electricity and vice-versa. We have multiple energy goals: reducing the release of GHG, minimizing costs for the consumer, reducing the risks from cyber attacks, and providing electricity with a very high reliability, to name some major ones. Achieving all of these goals inevitably results in some give and take. If one thinks of different energy sources as “tools” then multiple tools should be able to reach the best overall result. Therefore ideological conflicts between decentralized energy resources vs. centralized sources or renewable energy vs nuclear energy or “big solar” vs. “distributed solar” leads to less than optimum results. One wouldn’t ask an expert cabinet crafts person to just use one tool out of his/her toolbox. A very important study was made a number of years ago. I believe the title of the report was something like “California’s Energy Future” and it should be in the OEPF library. This study examined what California might do to essentially eliminate its releases of GHG. Unlike other “extreme” energy future analyses like an “all solar” or an “all nuclear” future this study had a mix of both major non-carbon sources,plus conservation. However, at the end of the day the study concluded that with all the tools available it still could not get the GHG releases low enough. This was because it did not have a practical way of eliminating the need for high energy density liquid fuels used in air travel, heavy vehicles, and ships. My point here is if we are mired in ideological conflicts and seek extreme energy futures we may not recognize that a much larger environmental issue has to be dealt with. Let me suggest an example in an area I believe you are interested in: Offshore wind power and the possibility of getting high reliability by using many off shore wind turbines are joined together. My view, influenced by the California report, is that making electricity from offshore wind turbines is not the best use of these turbines. We already have multiple sources of electricity on shore. However, it might be possible to use the carbon dioxide that is more concentrated in the near surface of sea water plus the water itself, along with the electricity from the wind turbines, to make methanol and perhaps butanol. If we make butanol we should be able to use much of today’ s petroleum distribution infrastructure. Today we have a “once through” fossil fuel system. Fossil fuels are extracted , burned, and their byproducts are released to the atmosphere and subsequently to the oceans. An alternative approach which could provide high energy density liquid fuels but with no net GHG releases would be to extract CO2 from seawater, create methanol of butanol, burn the methanol or butanol and release CO2. This CO2 might then eventually get absorbed back in the ocean, resulting in no net CO2 released to the environment, i.e., a closed cycle instead of a once through cycle. This would be expensive to do, but far less than the cost of climate change. In the interest of diversity we might add floating nuclear plants to the off shore wind turbines to make high energy density liquid fuels. Floating nuclear plants were invented in the USA and are being pursued by other countries now. Returning to the oceans as part of our energy future is far better than using the oceans as a “dump”. Interesting thoughts. I have focused on the changes we need to make for electricity and maybe I can send you back to the drawing boards to find value in wind energy? After all battery technology is going along fast and driving with electric cars will dramatically decrease oil use and increase electricity use a bit. On the plus side for wind is a Danish study that says “An onshore wind farm with 100 3 MW turbines would deliver 15,780 GWh over the course of its 20 year life and is comparable to the annual energy consumption of 235,000 Danish households. As the total energy required during the full life cycle of a 3 MW onshore turbine is about 4,300 MWh, the energy pay-back time is calculated to be 6.6 months.” https://www.steel.org/~/media/Files/SRI/Media%20Center/WindEnergyCaseStudy.pdf?la=en. Sounds good to me. •	“Cumulatively through 2050, wind’s pollution reductions would avoid $400 billion in climate change damages. Wind would save an additional $108 billion in public health costs by cutting other air pollutants, including preventing 22,000 premature deaths. I would also hesitate to use CO@ from the ocean in any way that doesn’t reduce the ocean’s CO2. Already, acting as a sink for CO2, the oceans’ PH is changing fast. Initial studies look very bleak about the damage that is occurring from the increased acidity. Finally, working with The Carbon War Room, RMI is finding ways to cut emissions from airlines with Sustainable Aviation Fuels, and in the shipping and trucking industries. I don’t see any of this as ideological conflict. I only see commercial “Merchants of Doubt” using the techniques of the tobacco wars to create this conflict. And, I believe we don’t have a lot of time to act. By committing to act with current tech, improvements are more likely to evolve.